Pain Physicians NY in Brooklyn, NYC provides elbow bursitis diagnosis, advanced treatment options and pain management care you need to reduce or eliminate your elbow bursitis pain. We suggest to avoid activities that will make elbow bursitis signs and symptoms get worse. Protect the elbow bursa from pressure and irritation using elbow pads. Prevent swelling by applying cold compresses. 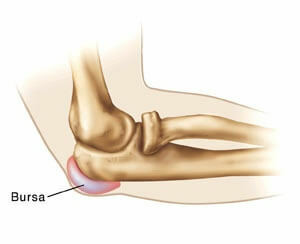 In chronic or severe cases of bursitis a surgery is needed in order to drain or even remove the bursa. Pain Physicians in Brooklyn provides a full range of advanced rehabilitation and pain management services including electrical nerve stimulation for chronic hip pain among latest cutting edge procedures: Body Composition Analysis, High Tech Shockwave Therapy, groundbreaking Interstitial Laser Therapy. Bursitis is an inflammation of the bursa. Bursa is a small sac filled with fluid located in the joints which reduce the friction between the moving parts of the joints. Healthy bursa sacs of the elbows are smooth and flat. They hold just enough amount of fluid to allow the bones slide smoothly when the arm is moved. Elbow bursitis is also known as olecranon bursitis, sometimes even as Popeye elbow. It is one of the most common types of bursitis. Elbow bursitis is an inflammation of the bursa in the elbow. The olecranon bursa develops usually after the age of 7. They are composed of a thin outer membrane which is called synovium and synovial fluid, located on the inner side. When this synovium gets irritated and inflamed, bursitis occurs. Injury of the elbow – any injury to the elbow regardless of its nature can cause a sudden bleeding and fluid build – up in the affected elbow, resulting into bursitis. Infection of the elbow – injuries at the bursa site can complicate with an infection, as well as any infection near the bursa can spread to the bursa. Inflammation – due to inflammatory conditions can also affect the bursa of the elbows. Swelling of the affected elbow – a tender lump may be felt while palpating the elbow due to an increased fluid in the affected elbow. Swollen lymph nodes in the armpit due to an infection, etc. Elbow bursitis is diagnosed based on a detailed medical history and anamnesis, accompanied by a physical examination of the affected elbow. Physical examination of the affected elbow is an important part of the diagnosis, as the inflammation of the elbow bursa is clearly visible and palpable. X-rays of the affected elbow are sometimes necessary in order to rule out any other cause of the signs and symptoms, especially after an injury of the elbow, when an elbow fracture is possible. The fluid from the elbow can be drained and examined in the laboratory when an infection is suspected. People with elbow bursitis should avoid activities that will make its signs and symptoms get worse. Direct pressure on the affected elbow should be avoided. Elbow pads are helpful as they can protect the elbow bursa from direct pressure and additional irritation. Applying cold compresses for about 20 minutes, a couple of times a day may help reduce the swelling of the affected elbow, as well as relieve other signs and symptoms of elbow bursitis. Compression of the affected elbow can help reduce the swelling and control it. Elevation of the affected elbow above the height of the heart will reduce the inflammation by reducing the blood flow to the affected area. Acute bursitis may require drainage of the accumulated fluid with a needle. After the drainage, medications are administrated directly through a syringe into the sac in order reduce the inflammation, which will lead to a faster healing. Chronic bursitis requires changes in the everyday life and protecting the elbows during daily activities like while playing sport, working, etc. Anti – inflammatory medicines are also recommended in order to reduce the inflammation while antibiotics are recommended when an infection is suspected. In severe cases of bursitis, when other treatment options don’t work, a surgery is needed in order to drain or even remove the bursa. However, surgery is rarely needed. Elbow bursitis pain management doctors and specialists at Pain Physicians NY (Brooklyn & NYC) provide a full range of diagnostic and advanced pain management services to help our patients return to a healthy and pain-free life style. Individualized approach, the most effective elbow bursitis pain treatment options utilizing the latest technologies available in USA. The pace at which technology is growing can make last year’s methods obsolete. Our team is always at the top of their game and at the head of the pack.